For this month I have decided to travel to the fi eld of U.S. state revenues for a selection of great items. For most readers these stamps will be quite unfamiliar, but their stories are just as interesting and perhaps will trigger some connections to the history and politics of their home or adopted state. The first item is from Kansas. The taxation of cigarettes in Kansas began in 1927 at the rate of 2¢ for packs of 10 cigarettes. Paper stamps were issued that featured the state bird, the western meadowlark, and the signature of the state auditor, Will J. French. In 1933 French had issued a new long strip format cigarette stamp that featured his portrait (Figure 1). Even though many of stamps were printed, few have survived. The Attorney General Roland Boynton and the Auditor Will French were implicated in 1933 in the Finney bond scandal that rocked the state of Kansas with the loss of over $1 million. Governor Alf Landon (elected in 1932 and reelected in 1934) declared martial law in Topeka. Although both Boynton and French were impeached, the state senate did not convict them. Both remained in offi ce until 1935. Quite probably because of the bond scandal, the responsibility for collecting the cigarette tax was moved to the Department of Inspections and Registration and A. W. Logan, the Director had the stamps overprinted to obliterate French’s likeness. It seems likely that the stamps with French’s portrait were in use a very short period of time. The obliterated stamps are readily available to collectors, but the original stamps are quite rare. The motivation for French to have his own portrait on the stamps remains unknown. A set of stamps that has strong negative political overtones lurking in the background are the fi rst beer stamps of Colorado, each with the signature of James H. Carr, the Secretary of State. Carr was linked to a shakedown of a firm trying to obtain a liquor license. The governor impeached Carr, who resigned before he came to trial before the state senate. In order to prevent this spilling over to the rest of the political party, all unused beer stamps in state hands were destroyed and a new printer was contracted to design and print beer stamps for the state. 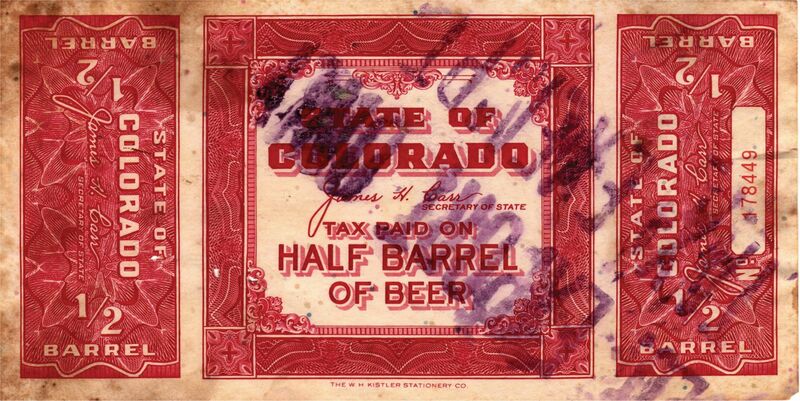 All of the Carr stamps seem genuinely scarce, but recently one of the half barrel stamps for 3.2% beer has surfaced with a large tax exempt handstamp overprint (Figure 3), signifying that the beer was to be exported outside the state and that the brewery was applying for a refund of the taxes. These handstamps are not plentiful and this is the first that has been recorded for the brief Carr term. While with the subject of beer being exported, which were exempt from state taxes, there are a series of stamps that were issued from Nebraska for that exact purpose. The Nebraska Liquor Control Commission consisted of three members appointed by the Governor. 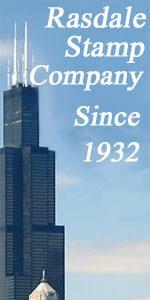 Beginning in 1935, the commission chairmen were Gass, McEachen (1938), Carmichael (1940), and Osterman (1942). From 1938 to 1944, it would appear that the three men on the Commission merely made the chairman position a revolving post, each taking their turn for two years. According to the Pruess catalog beginning in 1936 beer that was manufactured in Nebraska, but sold out of state, was to be stamped and the cost of the stamps was to be refunded. Pruess speculates that the export beer stamps with no monetary value were issued to facilitate accounting. If so, this mirrors what happened at the federal level with the Series of 1891 Fermented Malt Liquor for Export stamp. 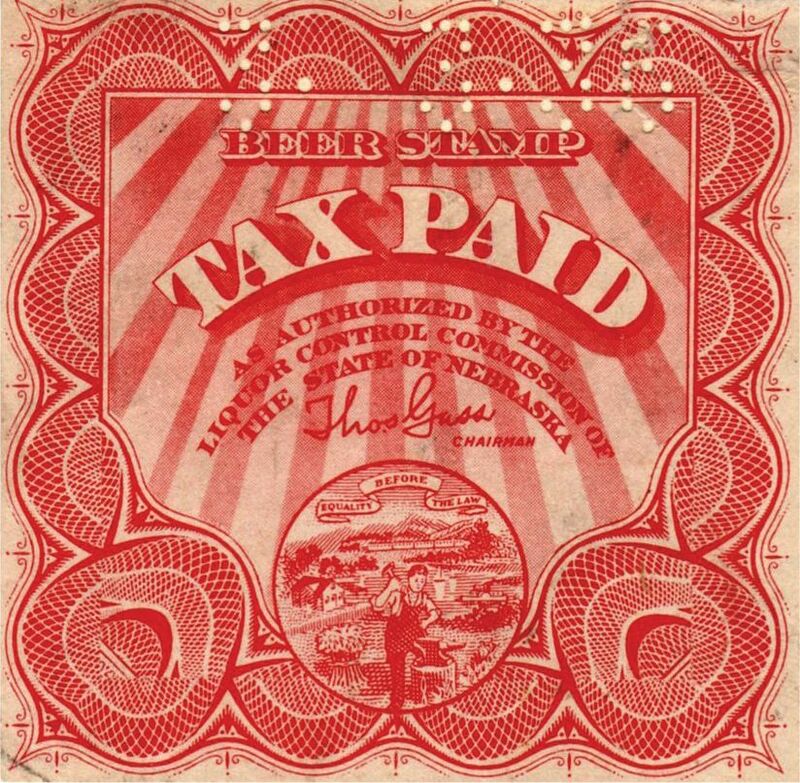 Both at the federal and state levels this practice allowed brewers to preserve capital, instead of having to pay the tax and waiting for the government refund, a very welcome relief during the Depression years The Nebraska export beer stamps are quite distinctive, printed in red, and feature the state seal (Figure 4). The state seal features a railroad train, sail and steam boats on a river, with a blacksmith in the foreground. To the philatelist who collects thematically these stamps have a signifi cant draw. Pruess in 1972 reported export beer stamps with chairman’s signatures for Gass, Carmichael, and Osterman, speculating that a stamp must have been issued with McEachen as chairman as well. Curiously, the stamps boldly declare TAX PAID on them, although it seems reasonable that this really meant TAX EXEMPT. None of these stamps is frequently encountered. We next travel to a different state and another beer tax stamp. From 1920 to April 7, 1933 there was no beer legally available in the United States. Prohibition was established with a constitutional amendment and intoxicating beverages were defi ned as exceeding 1/2 of 1% alcohol by the Volstead Act. The new Roosevelt administration made it a priority to abandon Prohibition and the first step before the repeal of the offending amendment was to replace the definition of intoxicating beverage. This was accomplished with the Act of March 22, 1933 which made 3.2% the standard above which was considered intoxicating. On April 7, 1933 beer of this strength became legal in those states which permitted it. States rushed to tax the new beverages to replenish their treasuries straining under the hostile conditions of the Depression. Delaware initially taxed this new brew at the rate of 3¢ per gallon and three stamps were issued in May, 1933. Only two of these stamps are known to have survived in collectors hands, a 9¢ stamp intended for 3 gallon cases (Figure 5) and 48¢ stamp for half barrels. In 1940, George Cabot reported the stamps were in use for about six weeks, when a more permanent law set the rate of tax on beer at $1 per barrel. The stamps feature the name of the Delaware Tax Commissioner, Pierre S. DuPont, a member of the prominent family in Delaware. Interestingly, the DuPont family was very instrumental in the movement to put an end to the Prohibition era. We move away from beer for our next examples, but do not leave the 1930’s. Those familiar with the Depression Era know how hard hit the farm communities were. Efforts to grow more produce to add to the farmer’s income were counterproductive. Overproduction resulted in lower prices - the law of supply and demand. In a previous column we looked at one of the federal tax exempt potato stamps, a part of the federal Agricultural Adjustment Act. Under the same general principles, states also established programs to establish the conditions under which produce was brought to market. Many of these programs featured marketing agreements and taxes to raise funds to aid in marketing produce. In most cases these programs were declared unconstitutional by the state courts (just as the federal programs were declared unconstitutional by the U.S. Supreme Court). Where stamps were used, they often had short periods of usage and because they were used on boxes, cartons, or baskets, the survival rate was very low. Washington state established a marketing program for tomatoes and cucumbers. The tax rates were 3¢ per 10 pounds or fraction thereof for tomatoes and 15¢ per 80 pounds or fraction thereof for cucumbers. For the 1935 growing season a 3¢ stamp was issued to cover the two commodities (Figure 6). This particular example has a hole, presumably from the tack that held it to the container on which it was placed. These stamps were in use a few brief months before the program was declared unconstitutional. Few have survived in collectors hands and, in spite of their simple design, are avidly sought by state revenue stamp collectors. It has been reported that there are two styles of serial numbers. Frankly, most collectors I know would be very pleased to have a single example in their collection. California was the most successful state in devising a state version of marketing agreements that withstood judicial challenge. Most state revenue collectors are familiar with the tomato proration stamps that were issued into the years of World War II. 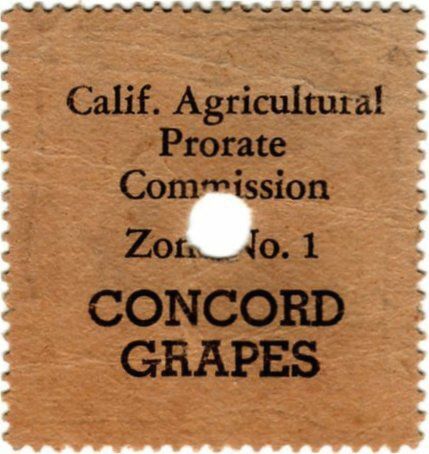 But few have seen similar stamps issued for concord grapes. They were issued in only two years, 1934 and 1936 and they have been reported in several colors for each year. The different colors were presumed to have been the designators of a marketing period (in the case of the tomatoes the period of time was often three or four days). The marketing period for each color for the concord grapes is unknown. Any concord grape stamp is a great rarity and missing from most collections. The one shown in Figure 7 is from 1936. Finally, we turn to another stamp from the marketing agreement of the Depression years. This one is from Florida and was used on shipments of oranges and grapefruit (and possibly tangerines). Florida, along with California, Georgia, and Texas, had established inspection programs to insure the maturity and quality of the fruits that were being shipped from their respective states. 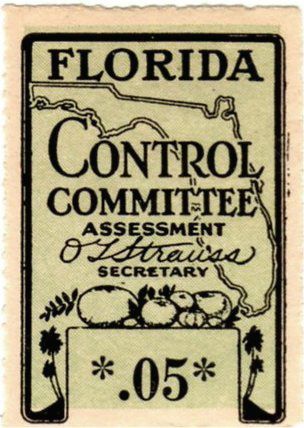 When the Depression was in full swing, Florida established marketing agreements for citrus under the Florida Citrus Control Committee, using these funds to advertise their fruit. Like most state marketing agreements, Florida’s did not withstand judicial scrutiny and the program existed for only the 1934 growing season. The stamps from this program are rarely seen (Figure 8). Florida, was not to be deterred. In 1935 the legislature established the Florida Citrus Commission with taxes on oranges, grapefruit, and tangerines. The taxes went into separate advertising accounts for each of these fruit and there were stamps for these as well. The story of the frequently encountered advertising stamps will be left for another time.